I found the coolest product at Safeway. Well, my version of cool. 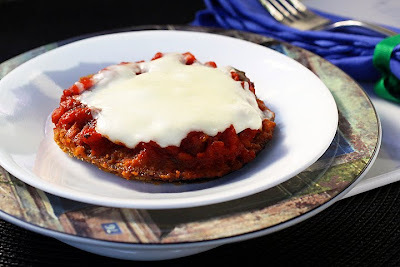 Frozen breaded eggplant without a bunch of garbage in it! I know, you’ve probably already heard of this amazing prepared food, but I’m in small town Idaho and don’t get out much. I was even more amazed when I opened the box. Inside were big fat sliced and breaded eggplant, nothing more. No preformed weirdness and the pieces were all different sizes just like they should be. This has to be the best convenience food ever. I should send the company a love letter. I wonder if they'd put a restraining order on me for being such a nut. The sauce was just a doctored up jar of good quality marinara, but wow! This Eggplant Parmesan gives my homemade version a run for its money in about an eighth the time. What a great healthy meal to have on a weeknight. Oh, I didn’t tell you this meal is healthy? It is! Especially if you bake the cutlets like I do and use just a thin slice of mozzarella on top. To make this dish vegan, use vegan cheese or leave it off entirely. Slow cooker method: In a small slow cooker add the marinara sauce, wine, olive oil, oregano, and sweet paprika. Cook on low for 6 hours or high for 3 hours. Stove method: In a large sauce pan reduce the red wine by half over medium high heat. Add the marinara, olive oil, oregano and paprika and bring to a simmer. Cover and simmer for 10 minutes. Prepare eggplant cutlets according to package directions. If baking, flip cutlets over the last 5 minutes of cooking time. Add an extra 5 or 10 minutes if cutlets aren’t crispy and golden brown. Place on plates, spoon hot marinara over the eggplant and top with thin slices of mozzarella. Garnish with Parmesan cheese if desired. Notes: If you have it on your oven, the convection setting works well for crisping up these eggplant cutlets. Fast n easy... i need more meals like this! I'm heading to safeway right now. We love eggplant parm, and this product would make that delicious dinner so much easier. Thanks for sharing sweet girl! ok - looks fabulous - but what if you can't get the Safeway stuff? :o) How does one 'bread' an egg plant [or, as we say, aubergine!] cutlet?? Do you realize how much I love eggplant.... do you??? I must find this eggplant! What a timesaver. I have yet to find a pre-prepared food item that isn't in perfect exact form, size and shape. I would say that is DEFINITELY way up on the cool scale. A nice quick variation for sure! @ l'optimiste who asked about how to bread eggplant, here is a recipe: http://www.simpleitaliancooking.com/recipes/fried-eggplant-recipe.htm. It is for fried eggplant cutlets - basically the exact same thing just fancy wording. This is how it was done in my family when making eggplant Parmesan.